Well, my schedule has obviously gone haywire. Here I am posting about Helen Hunt after Rita Wilson has aired. But I'm working on catching up! I knew even less about Helen Hunt before this episode of Who Do You Think You Are? than I had about Kim Cattrall (in fact, I get Helen Hunt and Linda Hunt's names confused). The introduction was a short overview of her work, including the factoid that she is only the second woman to have won an Oscar, an Emmy, and a Golden Globe award in the same year. She had heard about her mother's family, but didn't know very much about her father's side. His mother had died young, when he was only 5. Hunt wanted to find out about her father's European Jewish family for her daughter, so that she could know where she was from. Hunt went to visit her father, Gordon Hunt, who showed her photos of his mother with his grandmother, Florence Roberts. He knew that the family name had originally been Rothenberg but didn't know when it had been changed. (My great-grandfather changed his name but our family also kept the memory of what the original name was. Not everyone is so lucky.) Gordon Hunt had never known his grandfather but knew that he immigrated from Germany to New York, that the family eventually moved to Pasadena, California, and that his grandmother used to live in the Green Hotel. Hunt wondered where the money had come from that allowed her to live in a hotel. She drove to Pasadena to start her research. At the Hotel Green, Hunt met with Marc Dollinger, a professor of Jewish studies at California State University at San Francisco. Hunt said that she had asked Dollinger to do the research. This refreshing approach was maintained throughout the episode; Hunt did not pretend to have done any of the work herself. She asked Dollinger how Helen Roberts could afford to live in a hotel. Unrefreshingly, Dollinger said they should search in the 1900 census on Ancestry.com. It was nice, however, to see him drill down specifically to the 1900 census database, as opposed to searching from the home page. When you know what information you are looking for, it is far more effective to search in that specific database. Florence Rothenberg was found with her husband Gustav, four children (including Gordon's mother, Helen, as a 1-year-old), and four servants. They were living in New York City. The servants obviously suggest that the family had money. Though it was not shown on television, the census also indicates that Rothenberg owned his house free and clear. In what is probably a coincidence, the last name of the family's next-door neighbors was Roberts. Dollinger showed Hunt a copy of Gustav Rothenberg's death certificate. He died December 15, 1900 in New York. Dollinger then had Hunt search in the 1910 census for Florence. That year she was living in Pasadena, California. All four children were in the household, but there were no servants. Dollinger said he didn't know why the family had moved to Pasadena but commented that between 1900-1950 the Jewish population in the Los Angeles area increaed 800%. Dollinger next asked Hunt to search for Florence in Pasadena in the 1920 census (and mentioned Ancestry.com again). He had to restrict the search to Pasadena because eleven other Florence Rothenbergs are in other locations; no result was found for Pasadena. Then he had Hunt look for Florence Roberts, and there she was. For some reason they showed the search page twice while looking for her under Roberts. Florence still had two children at home and had a servant again. There was some discussion of why Florence would have changed her name. Dollinger talked about how Jewish refugees coming to the United States were fleeing starvation, persecution, and other ills and how quotas were established in 1921 to stem the number of immigrants. He said that Jews already in the U.S. suddenly began to face discrimination as an indirect result of the quotas and that it might have been good not to have a Jewish-sounding name. That's all well and good, but Florence had already changed her name by 1920, so his short history lesson doesn't explain her motives. What occurred to me is that she might have changed it due to anti-German sentiment during World War I, as many other people did. After all the talk about Hotel Green, it was surprising that they did not show Florence in the 1930 census, because at that point she was actually living in the hotel. Instead the next document was Florence's death certificate (she died September 1, 1949), which showed her father as William Scholle. They didn't talk about her mother, giving us a strong clue that her father's line was going to be pursued next. We were then shown a copy of an 1845 ship manifest for travel from Bavaria to New York City with Wolf Scholy on it. Dollinger mentioned that Wolf is a common German name and glossed over the different name by saying that William is a more "American" name. I've heard that some people were confused by this quick treatment of the subject and didn't understand how Wolf and William could be the same person. Many immigrants to the U.S. had names that were traditional and even common in their native countries but that stood out when they arrived here. Most people wanted to assimilate, find work, and create new lives. If your name was something like Joyne Gorodetsky it might be hard to get a job, but rename yourself Joe Gordon and you could fit in better. While there were (and are) no "rules" on what to change your name to, it was very common to see someone keep the same first initial. Changing Wolf to William was also very commonly seen. As usual, we weren't shown all of the research, but it is quite reasonable to believe that links were found to connect Wolf Scholy to William Scholle. On the 1845 manifest Wolf was listed as a farmer. Dollinger explained that an economic depression was going on in Europe at that time and that many people were moving to cities and overseas. By 1853 William appeared to be in a clothing business with his brother Abraham. A New York City business directory listed the two men in the same business, Abraham at 174 Broadway and William in San Francisco, California. Dollinger elaborated that 1848-1850 was a fortuitous time because of the discovery of gold in California. William had come out during the Gold Rush and found that his language and business skills were useful and profitable. Hunt said she didn't know anything about the Gold Rush (she's almost 49 years old; didn't they teach that in schools back then?!). She decided to drive to San Francisco to learn more. They showed her heading out and driving a vehicle, but when they showed her going over the Bay Bridge she was a passenger, which was an odd non sequitur. At the San Francisco Public Library (I think they were in the San Francisco History Center on the sixth floor) she met with Stephen Aron, a professor history of the American West at UCLA. (Was anyone else amused by the fact that the San Francisco professor was filmed in Los Angeles, while the Los Angeles professor was in San Francisco?) She told Aron flat out, "I know nothing about the Gold Rush." Aron had found William "Schele" in the 1852 California census (which they had to show on paper, because Ancestry doesn't have the entire census available yet). He talked about how the population in San Francisco had exploded after the discovery of gold and that merchants and businesses that supplied clothing and other items to the miners were the ones really making money. He also mentioned that crime was rampant in San Francisco but didn't tie the comment to anything else. 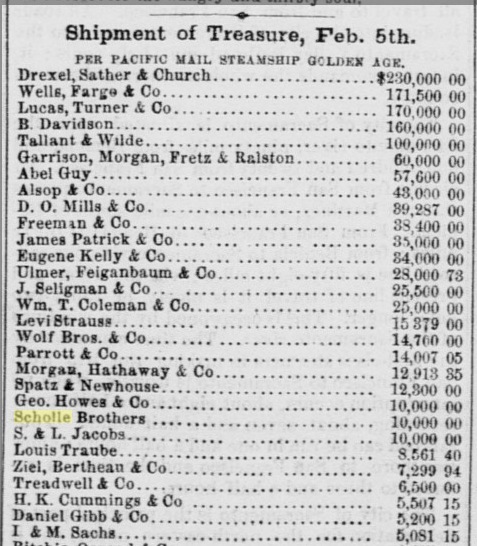 Next we saw a clipping from an 1855 newspaper (which I didn't see the name of) with the title "Shipment of Treasures." It listed the Scholle Bros. with a large amount that Aron said would be equivalent to about a quarter of a million dollars today. Obviously the Scholle Brothers were doing well in business. (I couldn't find the exact article used on the program, but the one to the left, from the Sacramento Daily Union of February 7, 1856, is similar. I found it on the California Digital Newspaper Collection site, which I'm sure is where the program's researchers found it also. It is not available on Ancestry.) Aron then produced an 1858 city directory page showing Jacob and William Scholle as manufacturers and importers, with an address of 4 Custom House in Sacramento. The next document was the 1870 census with William and Rosa Scholle. Their daughter Florence was there, as were three "domestic servants." Aron showed photos of William, Rosa, and Florence with an unnamed sister but did not say where the photos were from. 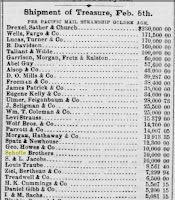 The last item he showed Hunt was an original San Francisco newspaper from November 28, 1874 with an article about "Solid Men" who were worth more than $1 million. Among the men were Jacob and William Scholle. In the 20+ years since they had immigrated to the U.S. they had gone from farmers to millionaires. Hunt went from the library to the old San Francisco Mint to speak with Frances Dinkelspiel, author of the book Towers of Gold (the full title is Towers of Gold: How One Jewish Immigrant Named Isaias Hellman Created California, which shows more than a little bias on the part of Dinkelspiel and doesn't give enough credit to the people who worked with him). Dinkelspiel showed Hunt a New York Times article about when the Nevada Bank was to be sold. It mentioned Levi Strauss, the Scholle brothers, and Isaias Hellman as investors. Dinkelspiel revealed that Hellman was her great-great-grandfather, as Scholle was Hunt's great-great-grandfather, so the two women share a connection that dates back four generations. Dinkelspiel showed a second Times article which discussed the merger of Wells Fargo and Nevada Bank, a transaction engineered by Hellman. Investors included the Lehman brothers and again the Scholles. These men and other Bavarian Jewish immigrants came to the United States, established themselves strongly in business, and prospered. They truly were living the American dream. That segment ended the research into Hunt's Jewish ancestry. From San Francisco she traveled to Portland, Maine to learn about her great-great-grandfather George Hunt I, a businessman who traded in goods. Hunt said she had asked Herb Adams, a local historian (and former Maine state representative), to do the research for her. He found that George had imported sugar from the Caribbean and exported wood. He incorporated his company in 1863. Adams also found George's obituary, which stated that he left a widow and two sons. The emphasis of the research results then quickly shifted from George to his widow, Augusta Barstow Hunt. Hunt went to the Neal Dow House (Neal Dow sponsored the 1851 liquor law), now the home of the Maine chapter of the WCTU, where she met with Carol Mattingly, listed as a temperance historian on screen but as an English professor at the University of Louisville Web site. She talked about how the temperance movement was a reaction to rampant alcohol abuse. Women rallied to the cause because of abuse. Married women had few legal rights and little recourse, so they banded together for social change. At the eleventh annual WCTU convention Augusta gave the opening address. Mattingly showed Hunt a cabinet card photo of Augusta, along with photos of her children. Hunt recalled that her grandmother had been killed by a drunk driver. This was alluded to in the beginning of the episode and I admit that I missed the hint it gave of what was to come. Hunt conceded that she had had a negative reaction to the topic of temperance but that it was an important social issue. She wondered how long Augusta had lived and whether she would be able to find out about her death. The final research segment took Hunt to the Maine Historical Society, where she spoke with Shannon M. Risk, an associate professor of history at Niagara University. Again Hunt did not pretend to be doing the research but said "she would do research for me." Risk had found a short biography of Augusta which stated that she was president of the WCTU chapter for fifteen years. The WCTU had brought about daycare, kindergartens, women on school boards, and social activism. The women's rights movement grew out of the temperance movement. In 1917 Augusta and other women gathered signatures for a proposal for women's voting rights in Maine. The proposal was voted down two to one. Augusta did live long enough to see the 19th Amendment, which granted women the right to vote throughout the country, pass in 1920. Risk produced a 1920 voter register and suggested Hunt look through it for Augusta. Then they tried to build some drama -- Hunt said, "I hope she's in here," and "I don't see her." (Like with this lead-in there was any way she wasn't there?) Risk told her which district to check, and Hunt finally found Augusta M. Hunt at 165 State Street. Then Hunt wondered, "She registered, but did she actually cast a ballot?" That meant we knew it was coming. Risk showed Hunt a newspaper article published on the occasion of Augusta's 90th birthday. It mentioned that hers was the first woman's ballot to be passed. Augusta died ten days after the article was published. Hunt went to the grave of George and Augusta and made a rubbing of the tombstone for her daughter. There was no wrap with family members, which was surprising, but she became very emotional as she discussed the revelations that had been made in the episode. I found it interesting that both sides of her family created considerable fortunes. And I am still good on my predictions! I said that Hunt's episode might deal with her Jewish grandmother, and it also tied her family to important times in American history, the temperance movement and women's voting rights. What does that make me, six for six? I liked that they were more up front with the fact that others are doing the research for you. I really wish they would have at least a little bit of education time in each episode - how to do a search, what to do if you run into walls, where else to look... even how to get the most out of a search on Ancestry.com. Ah well, it's entertainment, not education. I also really liked her taking the rubbing of the stone. That was a nice touch. It may have been totally set up - I bet a producer had the large paper and crayon - but still it was a nice way to show how someone could take a bit of their own family story back home with them. It really is a shame they are so obviously entertainment over education, because it was such a great opportunity to let people know more about actual genealogical research. But such is the nature of broadcast television. As for the tombstone rubbing, we know everything is supplied by the show, but we can at least think that it was her idea to get the rubbing, right? I was quite surprised that Helen Hunt's father, Gordon Hunt,knew noting of the Scholle wealth on his grandmother's side! Surely he would have been an heir as his mother's only child? It's possible that by the time Helen's mother died in 1949 there was not a large estate to leave. Florence had several children, and any inheritance was probably split between them. And we don't know how Helen lived. On the other hand, he was 20 years old when his grandmother died, so he likely did know her. Since they didn't address any of this in the show, we really don't know. When I watched the show, was memorized by all the information.. Then heard her grandparents of Augusta & George of Maine.. Also when she or they said something of Merrill tree member.. I took a moment and searched if there was a connection.. Awesome,, was very pleased... Still more actors and actress have family members in Maine.. Sweet..
How many of your family lines are from Maine? I just found this article, a few years after it was written. Just to let you know. I did not choose the subtitle for Towers of Gold: How One Jewish Immigrant Named Isaias Hellman Created California. My publisher did. My original subtitle was Isaias Hellman and the Creation of California.